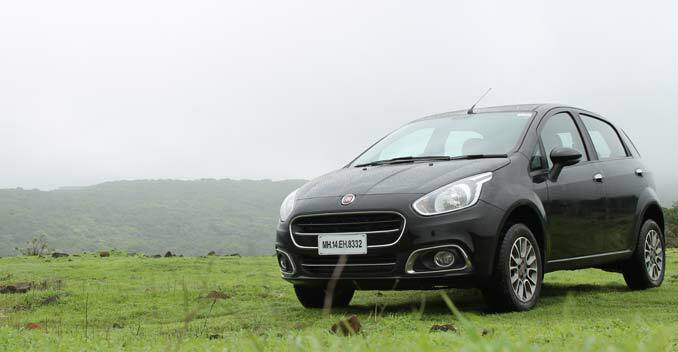 It was at the 2014 Delhi Auto Expo that Fiat India first shared its plan to bring 4 new cars to India. Two out of the four, i.e. the Linea and the Punto, aren't strangers to the country; the Italian car manufacturer has stuck to these two cars ever since they were launched here around 5 years ago. So, Fiat India is basically adhereing to Tennyson's advice i.e. 'Ring out the old and ring in the new.' The Linea has already received an update and considering the Punto's poor sales performance over these years, the hatchback was also in dire need of a new face. So the Punto was updated internationally and rechristened as the Punto Evo. Though this update won't be coming to India, the new name will. To be known as the Punto Evo, the India-bound hatchback's new face will be exclusive to our market. Long story short, this is the India version and you won't get it anywhere else. One look at it and it is quite evident that the Punto Evo previews the upcoming Avventura. We asked the folks at Fiat about it and they said that this isn't how they had planned it, at least initially. The Punto Evo was supposed to get a completely different face, but the overwhelming response for the Avventura at the 2014 Delhi Auto Expo led them to reconsider their strategy, which eventually caused them to make this change. The guys responsible for design at Fiat have redesigned the head-lamps, front bumper and the bonnet. The bonnet now sports a bulge with two prominent lines running down all the way to the Fiat logo. The hatchback seems to have taken a cue or two from the Germans this time, which has only led it to to lose a bit of Italian flair that the earlier model had. However, that doesn't mean it doesn't look good. The swept back head-lamps are an all-new design and are much larger, thank to the extensions on the sides. Chrome treatment to the front and the fog-lamp surrounds help the Punto Evo look rather premium. The side profile of the hatchback is essentially the same, but the new-design alloy wheels give the car's overall stance an edge. There are two different styles on offer; the first, an Abarth style 15-inch, diamond cut. On the other hand, the wheels on the more powerful Punto Evo 90 get a different design along with a lighter shade rim. The size has also been increased to 16-inch. The rear end of the car is almost similar to the previous generation. Also, there is hardly any badging around the car, so good luck if you were thinking of figuring out which one is petrol and which one is diesel just by looking at the badges. Moving on, LED tail-lamps grace the rear of the Punto Evo, and they look gorgeous. Just so you know, these tail-lamps are the same as the ones seen on the international version. Inside, the car gets an all-new dashboard, and though it looks similar to that of the new Linea, it still brings in a refreshing change. A more rounded approach to the dashboard's design and dual-tone interiors (black and beige) is observed in all the Punto Evos except the Punto Evo 90, which gets sportier all-black interiors. The centre console receives a piano black finish and looks brilliant. Then there is also the automatic Climate Control, and Blue and Me technology. The car I drove had CD/ MP3, USB, Aux-In, Bluetooth and voice recognition. So rest assured there are tons of features on offer as one goes up the variants' ladder. Furthermore, there are new dials that add that bit of much-needed flavour since the rest of the inventory remains unchanged. That said, Fiat still needs to improve in the fit and finish department. While the area around the dashboard and centre console looks neatly set up, it is the areas between the steering wheel house and the dashboard that let you down in terms of fit and finish quality. Infact, the lever for the driver's seat height adjust in our car was broken and the plastic quality was not exactly the best. Now, the engines. There are no mechanical changes to the car and the powertrains - 1.2-litre petrol and 1.3-litre diesel - have been carried over from the previous generation. Fiat is also adding a sporty 1.4-litre petrol to the Punto Evo's engine options, which is capable of churning 88bhp and developing 115Nm torque. We got to drive the 1.3-litre 75bhp churning mill and to be frank, there is no difference in the way it rides and handles. The car is stable at high speeds and it creates a sense of deja vu as it reminds you of its predecessor. If you loved driving the earlier one, you will like this one too. You think it'll be quick and make a dash for it by thrusting your intentions on the accelerator, but the engine clearly has different plans which brings us to the point of the essential lack of urgency. The lag is very evident in the diesel version and the gearshifts aren't the slickest in the market either. Fiat could have at least updated the gearbox to make the shifts a bit smoother in order to make city driving easier. You cannot help but draw comparisons between this and the Volkswagen Polo or the Hyundai i20. While the latter have chosen electric power steering which makes them easier to manouveur, Fiat has stuck to the hydraullic assisted version and it makes a lot of difference when driving in traffic conditions. However, the stiffness of the suspension and the accuracy of the steering make it one of the most fun cars to drive in the segment. The only change that Fiat has managed to make to the engine is improve the diesel's fuel efficiency by 5%. The Punto Evo now delivers 21.2Km/l, whereas the predecessor delivered only 20Km/l. Fiat might have upped the ante as far as the Punto Evo's looks are concerned, but when you compare the hatchback to its obvious rivals like the Volkswagen Polo and the Hyundai i20 (which will also be updated soon), you can't help but wonder if it will be enough. There is no denying that the Punto Evo is a refreshing change to Fiat's lineup; it also has a number of features to back its case. However, let's not forget that price is equally significant. There's a chance that Fiat might consider repositioning the Punto Evo, much like they did with the Linea. And if the company does manage to do that, the market is up for an interesting battle in this segment. That said, the Punto Evo is scheduled to launch in August this year, and we will be sure to bring you all the details. For the latest automotive news and reviews, follow us on Twitter and Instagram.